Wart - a skin disease characterized by small benign tumors on the skin, which is caused by the papilloma virus. Up to 71 % of all warts make up common warts. It is schoolchildren who usually have them (up to 20 %). The elderly usually suffer from plantar warts, which comprise about 34 % of all warts. Flat warts are not very frequent (4 %) and they affect mostly children. As a rule, warts are transmitted by contact with a person, who is a papilloma virus carrier. Furthermore, that skin disease is passed through common use items, especially if there is mechanical damage to the skin. 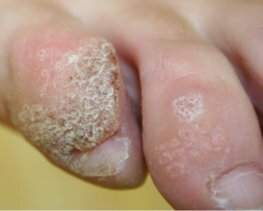 Warts can occur on the soles of the feet due to synthetic or too small footwear. In addition, warts appear owing to the impaired immunity and constant stress. How do warts look like? Common warts usually appear on palms and look like small (2-3mm), yellowish or skin color formations (papules), which may slightly peel off. While the warts are small and are not in the traumatized area, they do not cause great discomfort. However, when they start growing, the proliferation of warts induces a significant cosmetic defect. They may even hurt causing psychological discomfort. Flat warts usually appear on the back of the hand. They look like small red-colored plates, which may be blurred. The embarrassing case is related to plantar warts. They are painful and can interfere while walking. They not only grow fast (may even reach the chicken egg’s size) but also are difficult to cure. For the most part, the diagnosis is established with the help of a clinical examination. In rare cases, especially if a wart is traumatized, it is difficult to make a diagnosis; therefore, a doctor performs a biopsy of formation and histological analysis. Ideally, warts should be treated by an experienced dermatologist as misallocation of treatment may worsen the situation. The only treatment is a wart removal. Nevertheless, this cannot guarantee a 100 % recovery because while the formation is eliminated, the cause (virus) remains. Laser therapy is one of the most effective treatments since it is possible to accurately control a total wart removal without harming the surrounding tissues and ensuring more comfortable healing. Admission is performed by Viktoras Sidorovas, the Doctor of Medical Science as well as skin oncologist who has worked for many years in the Institute of Oncology at Vilnius University and who has done a doctoral thesis defense on The Study on Cutaneous Melanoma Prognostic and Predictive Factors. You can contact our center in Klaipeda city.